HTMA college students from the AIB College of Business in Des Moines, Iowa supported education for Cozumel kids in 2011 and 2012 by buying school supplies on sale in July-August. This has been a tremendous help in filling 180+ backpacks for children from families with very limited resources. HTMA’s mission is to develop a better understanding of the travel and hospitality industry through networking, guest speakers and having fun. 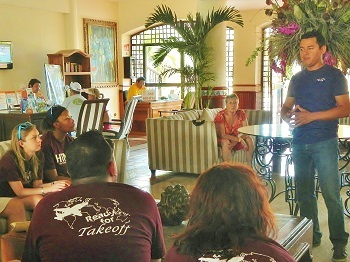 This year 10 AIB college students and two chaperones put HTMA’s mission into action by visiting Cozumel May 17-22, 2013 during the college’s Spring Break. Their volunteer efforts included a pre-trip service project, transporting donations to the island, meeting the director of tourism for Cozumel as well as conducting a project on-site to benefit tourism. We gathered the evening before the group left to view some of the video clips in their original format. The students have since returned to Des Moines and are back attending college classes. Some of the students are editing the footage to share with the Cozumel Tourism Department to use in promoting the island via social media. 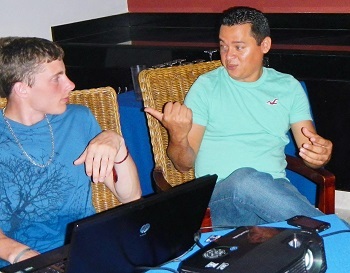 At Pedro’s request, HTMA members are documenting their personal experiences, discoveries and reactions as first-time visitors to help develop a profile of tourists’ concerns/issues as well as a profile of what they value most about coming to Cozumel. HTMA surprised Friends of Cozumel by presenting a $350 check during their recent visit to the island. The donation is a result of a pre-trip fundraising effort and is being matched by two donors to initiate a scholarship fund. College students reaching out to help others realize their dreams . . . Thank you HTMA group! The Friends of Cozumel scholarship fund is beginning with a modest amount of $1,050 US we hope to grow with other donations. You may be wondering if or how ~ $1,000 US can be of much benefit. It is a matter of perspective . . . Here in Cozumel, a high school age student can enroll in a technical training program at a public institution for $80-$130 US per semester. Undergraduate tuition at a public university is ~ $150-$250 per year depending on the program of study. Individual classes at a technical school are significantly less but still out of reach for many families struggling to feed their children. The scholarships will benefit local Cozumel residents with limited resources who have demonstrated a commitment to learning, who seek special technical training beyond secundaria or prepa (middle or high school) or a university education. Scholarships will also be available to non-traditional students such as single mothers who want to pursue specific skills or English classes to increase their employment opportunities to support their families as well as for adults who desire to learn to read and write. We plan to include a service expectation as part of the scholarship effort so recipients can “pay it forward” as a volunteer helping others in the community. Friends of Cozumel volunteer Larry Pedersen is an alumnus of AIB College of Business and proud to collaborate with HTMA, a great group of college students committed to service, learning and having fun. This entry was posted in Uncategorized on June 15, 2013 by pedersenll. We went to Cozumel in January and had a great time on the Occidental Resort Day Pass Tour. We love Cozumel, it is such a charming island with nice people. The beach was fantastic and I am sure the underwater world is unbelievable, we will try to book a snorkeling tour next time!